Farmers Donnie Tenney (left) and Charlie Radabaugh inspect sorghum canes at Tenney’s farm in Tallmansville, W. Va. before harvesting and processing into sorghum syrup. A hand-painted sign at the mouth of Tenney’s driveway welcomes guests during sorghum season. The weathered, gray sign is curiously positioned, on an exposed hilltop just before the road slopes downward into a hardwood forest one might expect to see when leaving town, not upon arrival. Before long, the grade flattens and the tree cover clears, giving way to a brief straight stretch through a slightly open valley. I pass a white church tucked away on the left, a handful of homes and the volunteer fire department on the right. Then, I notice a small structure adorned by mounted steel type that reads “Tallmansville, West Virginia 26237." “You’ll see it when you get to the Tallmansville post office,” I recalled from directions relayed to me over the phone. The plain brick postal building stands alone, under a towering flagpole, between Tallmansville Road and a meadow bisected by the trickling waters of Grassy Run. I immediately see part of what I’d come looking for: patches of tall leafy stalks whose tops have bronzed with autumn’s arrival. 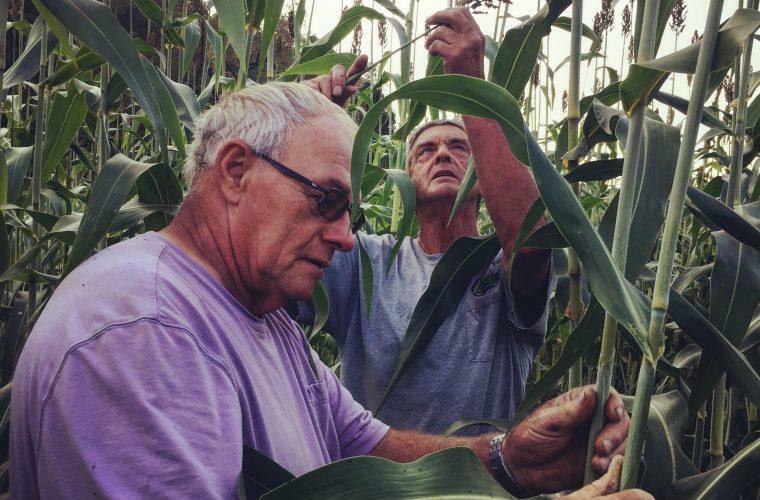 To a passerby, the fields on Donnie Tenney’s farm look identical to the ubiquitous plots of late-season corn grown on roadside farms throughout West Virginia. But a closer look reveals a plant that’s strikingly similar, yet more slender, taller, and, most notably, free of ears containing kernels, silks or husks. 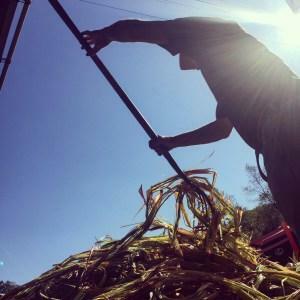 This is sorghum cane, the raw matter responsible for one of Appalachia’s most storied pantry staples. It’s a cool late-September afternoon when I first arrive in Tallmansville. 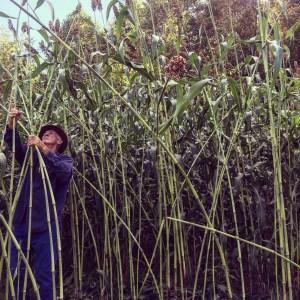 Tenney and his wife, Lorelei, are in the field stripping long, narrow leaves off the towering sorghum stalks by hand. Neighbors, friends and relatives have stopped by to help. At one point, nearly a dozen people are on site, some hidden deep in the cane thicket, detectable only by a steady, audible cadence of leaves being snapped and pulled, then tossed to the ground. A former Upshur County Commissioner, Tenney converses among guests with a sharp sense of humor and a friendly swagger one might expect from a small town politician. There’s plenty of jovial conversation, yet everyone is hard at work, each playing a vital role in a local pastime that’s always been a communal endeavor. The sorghum stalks must be stripped completely of their leaves before harvesting. Tenney’s friend and neighbor, Gene Hornbeck, reaches to bundle fully stripped canes, making it easier to harvest several plants at once, by cutting the plants at the base. Throughout the day, piles of dark green leaves accumulate between rows. The barren stalks are finally severed from their bases a few inches from the ground, then carried to a tow-behind utility trailer. 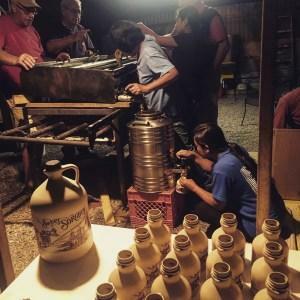 There, Tenney’s sister, Bonnie Kelley, and his mother-in-law, Liz Villegas, stack them neatly in preparation for the last steps in making sorghum syrup, a viscous, dark amber substance with a strong history in Appalachian kitchens. Though sorghum isn’t new to me or my cupboard, this is my initiation to its harvest. As a cook, I’m drawn to ingredients with depth and complexity. 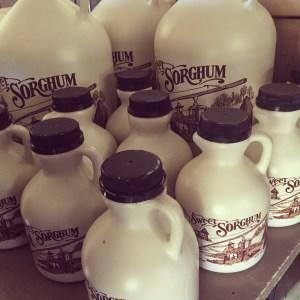 Sorghum syrup—sometimes referred to as sorghum molasses or simply molasses, despite a clear distinction from the sugarcane-based common molasses—certainly has that going for it. Its taste can be described as mostly sweet, slightly sour, with bitter, sometimes even smoky, notes. Its versatile flavor profile makes it perfectly suited for use in sweet and savory dishes alike, but sorghum’s complexity extends far beyond an interplay of tastes. At one time, long after the first seed varieties were imported on slave ships from Africa, West Virginia sorghum operations were a dime a dozen. Sorghum syrup was a product born of necessity, from a time when sugar was prohibitively expensive. First triggered when the Civil War crippled the deep south’s sugar industry, sorghum gained prominence as an easily accessible sweetener. A nationwide sorghum boom extended through the Great Depression, even longer in isolated rural areas. By the mid-20th century, as the cost of sugar fell, and homesteading tradition bearers passed on, sorghum production in the Mountain State largely fizzled out. I’ve often lamented that, despite the historical significance of sorghum in West Virginia, my own use has generally been limited to products from Kentucky and Tennessee, where its use is more common, and production occurs on a far greater scale. I knew of a small sorghum festival in Calhoun County, and occasionally read about non-commercial hobby operations scattered about. But I’d yet to notice a single jar of West Virginia sorghum on the shelves of local food retailers. This all changed last spring, when I was tipped off about two farmers producing, and selling, sorghum syrup in Upshur County. In late spring I finally met Charlie Radabaugh. 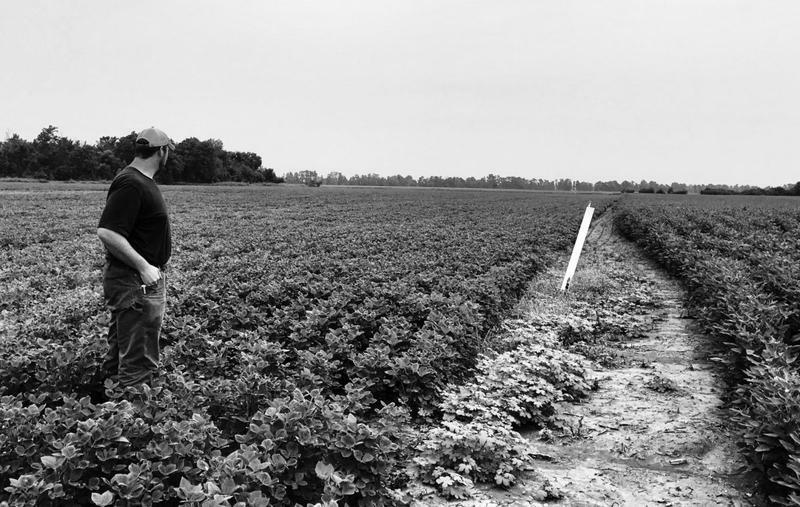 A lifelong farmer whose rugged hands alone tell the story of his hardscrabble work ethic, Radabaugh never drifted from his agrarian roots. Decades ago, he found steady work making ceramic fire bricks in a Buckhannon factory, but remained tied to his family’s pastoral homeplace. He eventually retired there, where he follows in his parents’ and grandparents’ footsteps, producing vegetables, maple syrup and, of course, sorghum. Our first encounter came at the farmers market in Bridgeport, where this year Radabaugh began making the hour-plus drive to sell his goods each Sunday from May through October. We met on the third market week of the season. Over the previous two weeks, he’d all but struck out seeking customers who knew what sorghum was, much less who wanted to buy it. Radabaugh was baffled to have met someone familiar with the contents of the pint-sized tan jugs arranged neatly beside his modest display of early-season produce. It helped when he found out I was looking to buy more sorghum than it seemed he might sell all summer. The feeling was mutual, though. I was ecstatic to cross paths with the local sorghum producer who, until that moment, existed only as a figment of my wishful imagination. We talked at length as he shared photos of the boiling process and told me of the mill on Tenney’s farm. He asked how I put sorghum to use, so I described some of my favorite recipes: a glaze for charred venison, a dressing for a wilted greens salad, desserts galore. What Radabaugh said is generally true, but not just in Bridgeport. Perhaps in one of the state’s few enclaves of affluence—a place relatively unexposed to the insolvent, seclusive conditions that extended sorghum’s importance in a place like Tallmansville—unfamiliarity with sorghum shouldn’t come as a surprise. But, by and large, in West Virginia’s rural, urban, wealthy and distressed communities alike, sorghum’s glory days have come and gone. Since I like to delve into the stories behind heritage-rich ingredients on my menus, I asked if I could visit in the fall, when processing season arrives. Without hesitation, Radabaugh urged me to do so. We’d keep in touch about it for months, all the way through mid-September, when he called to give me directions to Tenney’s farm. Radabaugh and Tenney are longtime close friends. During sorghum season, they're also business partners. Each grows several plots of cane, all of which is processed through an antique cast iron mill Tenney inherited from his father. Multiple growers, one central mill, all hands on deck. That’s how sorghum was typically produced in Appalachian farm communities, and it’s no different in Tallmansville today. 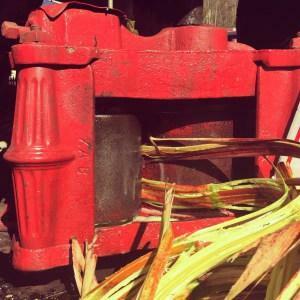 An iron sorghum mill, Donnie Tenney inherited from his father, crushes whole canes with drum-like vertical cylinders before depositing the plants’ fibrous remains. Just before evening, Radabaugh, who’s been at Tenney’s farm since early morning, drives a bright red pickup truck, hauling the trailer of stripped canes, to the processing site. Beside a dark wooden shed, he unloads them onto a long, narrow table where Villegas sits, ready to lead the milling process traditionally known as “squeezing”. Once everything is in place, Tenney starts the engine of his green John Deere tractor. A sturdy canvas belt connecting the tractor’s back wheel to the mill sets a series of gears and cogs into motion. Villegas picks up the canes from the pile, one-by-one. She moves them horizontally, from right to left, across her lap, feeding them through a boxed-off iron contraption that’s maybe two feet wide, just over a foot tall, elevated a couple feet off the ground. The mill’s robust vertical cylinders operate almost like those of an old wringer washing machine. 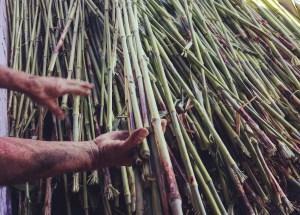 They turn inward, crushing the cane before slowly spitting out the plants’ ribbon-like fibrous remains out the other side, onto a rapidly growing pile. Charlie Radabaugh reaches for recently harvested sorghum canes, which will soon be milled in a process traditionally known as squeezing. The fresh sap, a bright green liquid, trickles into a bucket under the mill before being transferred to a shallow, metal evaporator under the shed’s awning. Here, late-arriving company continues to gather. Among the guests is Delmuth Kelley, a neighbor, who, like several in attendance, comes from just up the road. With an enthusiastic tone, Kelley describes frugal contraptions his father built long ago—a tractor system to mechanize the previously horse-powered milling process, a wood-fired evaporator so powerful it took six people just to skim the ash from the syrup as it rapidly cooked down. Liz Villegas and Lorelei Tenney work to skim a light foam from the surface of the sorghum juice as it slowly boils, reducing into a thick, amber syrup. Kelley talks about his parents’ use of sorghum during the Depression and both World Wars. He recalls farm families like his own raising meat, vegetables and grains, then collaborating with others to produce sorghum, since, as he says, “they’d need sugar every now and then.” As he recounts memories of hardship, thrift and ingenuity, the conversation returns to the way the sorghum syrup’s labor-intensive process has always been a symbol of cohesion among area residents. Put simply, before the age of iPhones and emails, more people talked to each other face to face. Spread out over hollows and ridgetops, they did so to get by. And while modern conveniences may have brought about greater ease to certain aspects of life, personal interaction, even in places like rural Upshur County, has diminished as a result. 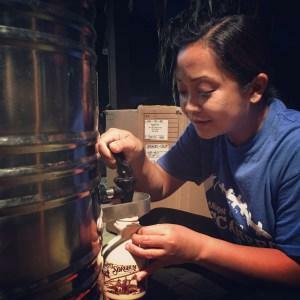 After the boiling process, Lorelei Tenney pours fresh sorghum syrup into pint-size jugs. I know exactly what he means. I’m no man of God, but I’ve been to my fair share of Sunday school picnics. I’ve experienced a comfort derived not from prayer, fried chicken or half-runner casseroles, but rather an intermittent reprieve from everyday rural isolation. I appreciate what my ancestors gleaned weekly over rhubarb pie at a whitewashed chapel in the woods of Braxton County, an unspoken reminder that when, not if, neighbors must pull together for celebration, grieving or mere survival, they undoubtedly will. I, too, long for a familiar sense of community, a trademark of the mountains that seems to have slightly eroded in recent years—a trend I attribute to several factors, including divisive election cycles and the rise of media-driven us vs. them narratives surrounding Coal Country or Trump Country, USA. It’s something I grew to appreciate as a youngster on a small farm, in a disaster-prone town on the banks of the Elk River. There, the need for apolitical coalescence never ends. (Last year, the town of Elkview, along with nearby Clendenin, was hit with widespread property loss, permanent destruction of my alma mater, Herbert Hoover High School, and deaths of several residents in the infamous flood of June 23, 2016.) When Kelley, Tenney and Radabaugh speak of maintaining, building and losing community, I understand. Though I sometimes feel my own sentiments teetering on the verge of cliché—“Appalachians may not have much, but at least they have community,” I can almost imagine hearing in the latest national newscast reporting the region’s peril—shrugging off a togetherness that shaped my affinity for place would be dishonest at best. Of course, it’s merely idealistic to think rural locales are, or ever were, immune from internal strife. But at a time of polarizing discourse, I’m reminded of my reverence for foodways as means to preserve what sense of community remains. I hold close the idea that finding time to gather, especially in the field or around the dinner table, safeguards the unique bond between mountain neighbors who, despite stark differences, will in some way always rely on each other to subsist. 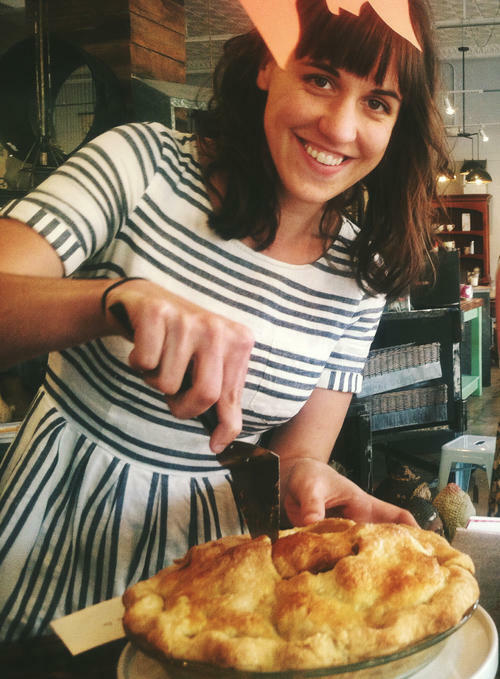 In my years in the kitchen and a decade working in the public policy arena, I’ve witnessed communal acts of making and enjoying food transcend political demarcation. Food is, indeed, no social panacea—as a mark of culture and class, what we eat can be polarizing in its own regard—but I’ve rarely left a hog roast, cider pressing or ramp supper contemplating ideological division over common threads in a cloth from which we’ve all been cut. As Kelley heads back to the field to strip more leaves and harvest more cane before nightfall, cookbooks with sorghum recipes are passed around. Early 20th century newspaper ads, shown on screens of modern smartphones, depict mills similar to the machine turning steadily just a few feet away. The conversation is one about sorghum’s value, but not in terms of culinary use or monetary considerations. To those at Tenney’s farm, the sweet sticky syrup reducing before them represents a century’s worth of history, heritage and fellowship. A plot of mature sorghum cane, grown on land owned by Donnie Tenney’s family for over two centuries, is ready for autumn harvest. As long as the cane grows behind the post office and the mill turns beside the shed, sorghum’s social value will live on, at least in Tallmansville. Tenney and Radabaugh have no plans to seize production anytime soon, but as they age, both know the future is not guaranteed. They’ve seen family sorghum boils and Sunday school picnics come and go. They understand the inescapable fragility of tradition. “We want to carry the tradition on to our kids and our grandkids so they can understand what Appalachian heritage is all about,” Tenney says, Radabaugh nodding slowly in agreement. 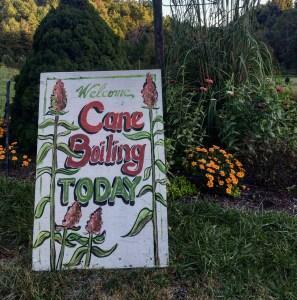 Nearly two weeks later, when I return to Tallmansville, a hand-painted sign reading “Welcome, Cane Boiling TODAY” sits at the mouth of Tenney’s driveway for the final time this year. Only a small pile of canes sits on the table near the shed. Villegas makes quick work of them, and before long, the mill sees its last turn of the season. After hours of heating by gas burners’ intense blue flames, the syrup in the evaporator maintains a slow, steady boil. Hanging fluorescent lamps illuminate the space under the shed’s awning as dusk turns to dark. 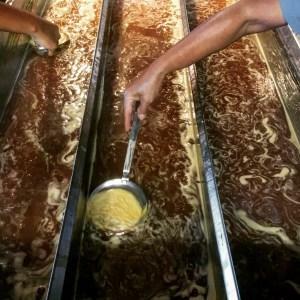 A bubbly foam is scraped from the steaming liquid surface, and the syrup drips from handheld skimmers at a markedly slow pace. It’s a sign. 2017’s final batch of sorghum syrup is ready for bottling. Donnie Tenney (far left) and his wife, Lorelei (far right), work with friends and neighbors to bottle sorghum syrup from a gas-heated steel evaporator at Tenney’s farm in Tallmansville, W.Va. In assembly line fashion, several dozen pint and quart-size jugs are lined up and filled from a spout attached to the evaporator. They’re momentarily set aside, then capped with black plastic lids. When the bottling is finished, a thin layer of syrup covers the bottom of the evaporator. Lorelei brings out a plate of yeast rolls from the kitchen, passing them out to those gathered around — eight of us in total. I go after the prized scrapings with a spoon grasped firmly in my right hand, smearing the soft, light bread held gently in my left. We continue to dredge the evaporator, like the giddiest of children, scraping cake batter from a mixing bowl in my grandmother’s kitchen. With processing finally done for the year, we drift back into a conversation initiated weeks earlier, one about sorghum’s future, the outlook for farming and for the region as a whole. Radabaugh and Tenney express hope for a younger generation of chefs and farmers to pick up interest in sorghum, their optimism bolstered by a recent encounter with celebrity chef and television personality Anthony Bourdain, who, during a visit to West Virginia, told them Appalachian sorghum might soon be trending nationwide. With his pitchfork in hand, Charlie Radabaugh prepares the crushed sorghum fibers for transportation to a compost heap on Donnie Tenney’s farm. I’m a firm believer in small-scale agriculture’s potential to help shape the region’s transition away from dwindling extractive industries, but I’m keenly aware of the harsh realities associated with farming. 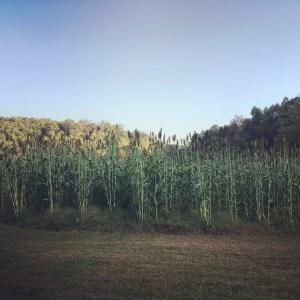 Will sorghum production be part of West Virginia’s economic future? I’m not certain, but I share Radabaugh and Tenney’s desires. I hope sorghum takes off once more. I hope this time-honored ingredient again sees widespread use in both home and professional kitchens throughout the Mountain State. I hope young farmers step up so Radabaugh and Tenney can one day walk away on their own terms, knowing sorghum still keeps communities like Tallmansville stronger than first glance reveals. Mostly, though, I hope future generations will tap into their shared food heritage as one way to rise above divisive times and maintain community, whether at sorghum boils, Sunday school picnics or any other occasion that allows neighbors to seek common ground while breaking bread. If such proverbial crumb ends up smeared with a spoonful of that sweet, slightly bitter syrup once so common in the mountains, a couple farmers I know surely won’t complain. Contributing editor Mike Costello (@costellowv ‏ ) is a chef, farmer and storyteller at Lost Creek Farm in Harrison County, West Virginia. Through his cooking and writing, Mike strives to tell important stories about a misrepresented and misunderstood region he’s always called home. 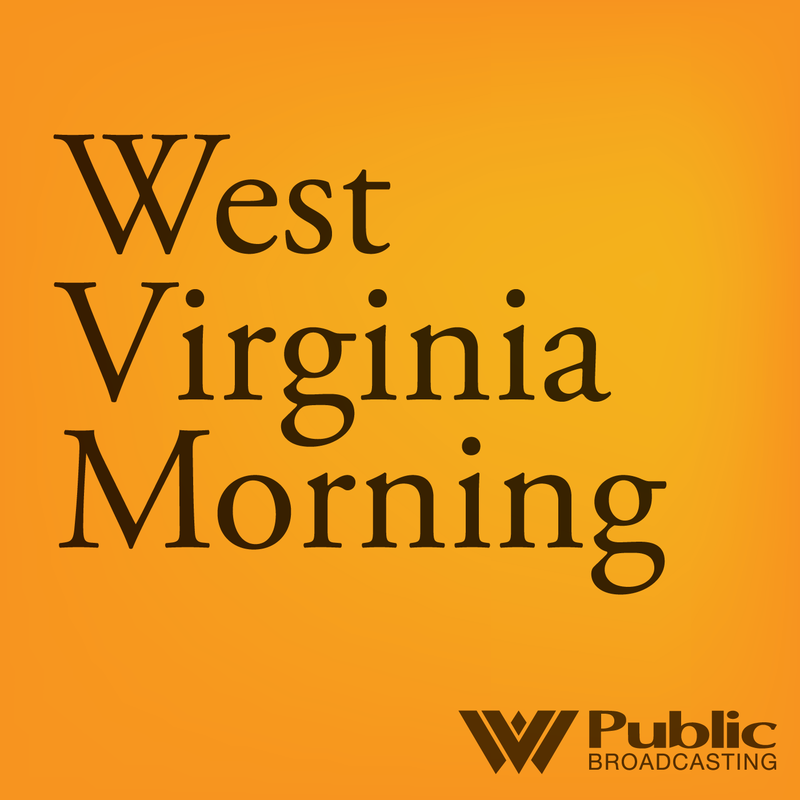 On this West Virginia Morning, the poultry industry is asking the U.S. Department of Agriculture to allow faster work speeds at some facilities that slaughter and package chickens. The industry says a new inspection program allows them to process hundreds of birds per minute. But as Nicole Erwin reports, worker and food safety advocates worry about higher speed in an industry with an already spotty safety record.